Combine ground chicken, egg, panko, garlic, onion powder, ginger, pinch of salt & pepper in a bowl. Mix well. Use hands to shape into 2" meatballs. Sprinkle with sesame seeds. Heat a skillet over medium , drizzle with olive oil, add meatballs. Cook evenly on all sides for 15 minutes or until internal temperature reaches 165. Pour sesame oil evenly around the pan during the last few minutes of cooking. Remove the meatballs, set aside. Reduce temperature to medium low. Add lo mein noodles to the pan and cover with water, cook until al dente. Drain water. Add sauce ingredients, bring to boil , stir in slurry mixture. Reduce to simmer. Mix well. 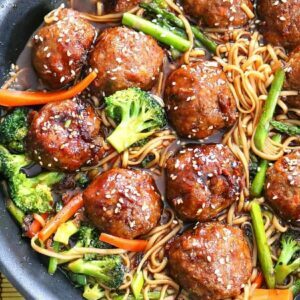 Add veggies, lo mein and meatballs back to pan. Cover and cook 5 minutes or until heated through.